Wrap-around lens constructed of lightweight, scratch-resistant polycarbonate delivers advance visual acuity and protection. Meets the ANSI Z87.1 standard for optical clarity and impact resistance. 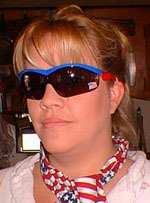 Click the button below to add the MCR Crews Storm Safety Glasses American Flag Logo w/ Smoke Lens to your wish list.